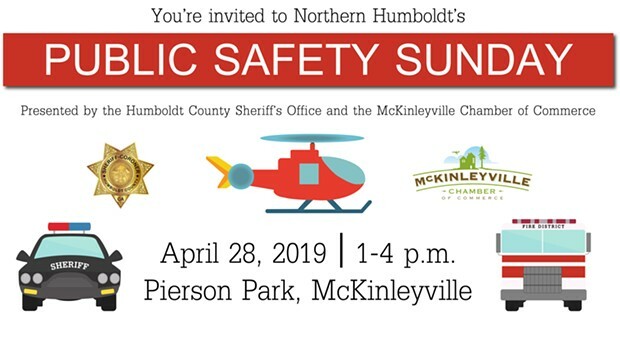 When: Sun., April 28, 1-4 p.m.
Join local public safety agencies for a day out in the park. Watch a helicopter landing, look inside the Sheriff’s Sno-Cat, Bearcat and other emergency equipment, meet HCSO K9 Gusto, learn how prepare for a disaster and more. Event Participants include: Arcata Fire District, Brant Electric, California Highway Patrol, Humboldt County CERT, California State Parks. California Conservation Corps, Humboldt County Animal Control, Advanced Security, Red Cross, Sheriff’s Citizens on Patrol, U.S. Coast Guard, Neighborhood/Business Watch, Sheriff’s Office of Emergency Services and more! Happening Sunday, April 28, 2019 from 1-4 p.m. at Pierson Park.